the Internet Archive | LIT.GAZ. I was having a clearout and tidy-up when I came across this book, which had lain unopened for half a lifetime; before passing it on to a charity shop, I glanced through what was one of the key texts when I was researching feminist science fiction all those years ago. It’s still brilliant. Showalter wrote this introduction to women’s literature/ novels by women in the mid-1970s: I’m not aware of anything comparable before then. 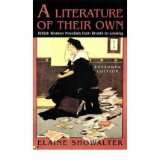 It’s very detailed and well-researched; the general introduction to women as writers gives an excellent overview and references a large number of texts which had previously disappeared into obscurity. She looks at the development of women’s writing from the historical, social, cultural, psychological and gender perspectives, dividing it into a number of key phases, which then receive fuller treatment in later chapters. Major texts (Jane Eyre, The Mill on the Floss) and major writers – the Bronte sisters, George Eliot – are explored in detail and if you need them, there are pointers to a wealth of other writers and novels. Many of these will have been out-of-print for years at the time she was writing; many are probably now more easily available, either through the efforts of such publishers as Virago or the Women’s Press, or because they are out of copyright and therefore available as electronic texts via the Internet Archive or Project Gutenberg. Showalter moves her reader logically from Victorian writers tot he first, early twentieth century wave of feminists and suffragists, exploring Virginia Woolf in some detail before ultimately condemning Woolf’s search for androgyny as utopian, and then moved into the 1960s second feminist wave, in which Doris Lessing figures largely. Whatever perspective one approaches women’s literature from, it strikes me that this is still the must-read for context. Obviously it could do with bringing up-to-date to take account of the last forty years.